Somewhere in the DNA of every professional racecar driver, from the great, to those filling the “also ran” end of the grid, are lessons learned in a small low horsepower car. In RMVR we class these cars in the “Small Bore” run group, but the excitement and the passion is just as big as the V8 group. A good small bore battle at LaJunta. Braking hard for Andy Gould’s Flamingos? 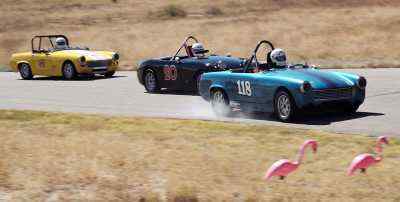 Most agree, however, that the keys to good lap times are found and developed in the small bore run groups. When the throttle doesn’t do much despite the dent in the floorboard from the force of the foot, one learns to carry speed wherever possible; to brake as late and smoothly as possible; to draft and pass while reading the air currents around the preceding car down the Pueblo straight, and where the so called “power” band is when the green flag falls. Small cars have somewhat smaller budgets as a rule. The tow vehicle and trailer can be smaller, less fuel needs to be hauled, tires are smaller and last longer than the big cars. Thus, Small Bore racing is RMVR’s largest race group. So large, in fact, that on most all weekends it is necessary to have two run groups to accommodate all the cars. Generally, one group contains the cars classified as EP, FP, and GP, and another race group is established for the faster CP and BP classes. It’s not uncommon for there to be 35-40 cars in each of the run groups. You may be assured of having a good time—there is always someone to race with, regardless of where you are in the pack. For assistance and questions you may have regarding running cars in this group, you can email one of the Small Bore Eligibility Team Specialists. Another great source of information is the RMVR Bulletin Board Small Bore Forum. Here you can post your questions, and readers will take a shot at getting you an answer ASAP. For complete information on RMVR rules, and an application to submit a car for RMVR eligibility, see How to Apply for RMVR Car Eligibility, a detailed guide to RMVR’s eligibility process.